Namchak Pudri (Tib. གནམ་ལྕགས་སྤུ་གྲི་, Wyl. gnam lcags spu gri) ‘The Meteoric Iron Razor which Vanquishes Māra’ is a Vajrakilaya terma practice which was revealed by Dudjom Lingpa in 1862 from several treasure sites in Eastern Tibet. Along with the Pudri Rekpung, Namchak Pudri is one of the two main Vajrakilaya practices of the Dudjom Tersar lineage. Out of the many wonderful traditions of Vajrakilaya, the Dudjom Namchak Pudri (The Meteoric Iron Razor which Vanquishes Māra) is one of the most extensive and profound. It carries the full consecration of the practice lineage. It is a spiritually direct revelation of special potency today. It integrates sacred words from the root Vajrakilaya tantras with key components of the principal Vajrakilaya lineages, and enlightened scholarship of the Vajrakilaya commentarial traditions’. The Purely Aware Primordial Wisdom Phurba (Wyl. rig pa ye shes kyi phur pa) is particularly developed in the Dzogchen section of the Namchak Pudri. The Compassion Emanation Phurba (Wyl. thugs rje sprul pa'i phur bu) is enlarged upon in the Ritual Manual and its long Commentary. Dudjom Rinpoche is exceptionally renowned for his expansive treatment of the kyerim in this practice. The Secret Bodhichitta Phurba (Wyl. gsang ba byang sems phur bu) is addressed at length in the section on the yoga of the tsa-lung, the subtle channels and energies. These three Phurba Transfixions are all focused on the Primary Ritual (stod las) for attaining Enlightenment. The Symbolic Material Phurbu (Wyl. mtshan ma rdzas kyi phur pa), the final Phurba Transfixion, is directed towards the liberation of hostile forces and obstacles, and is found in great detail in the Subsidiary Ritual (smad las) section of the collection. 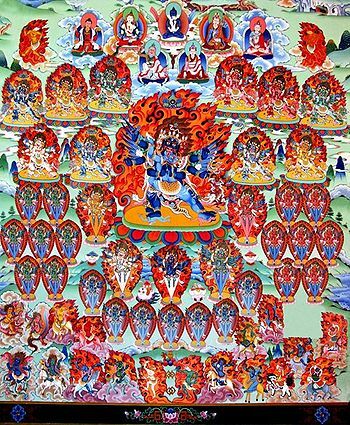 Vajrakilaya's supreme and common siddhis are bestowed with ease and the potency of (his) compassion is especially swift compared with other yidams. Thus, (he) is certainly the unique secret heart deity of all the accomplished vidyadharas of India and Tibet. In 1848, Dudjom Lingpa revealed the Zabsang Khandro Nyingtik cycle. Part of this large cycle is his Vajrakilaya practice called Tukdrub Sangwa Gyachen. Later, during the 20th century, Dudjom Rinpoche (1904-1987), incarnation of Dudjom Lingpa (1835-1904) arranged the Namchak Pudri Vajrakilaya practice on the basis of the materials found in the ‘Tukdrub Sangwa Gyachen’. According to Lopön Ogyan Tanzin Rinpoche, “Dudjom Rinpoche did intensive practices on and mastered Dudjom Lingpa's Vajrakilaya practice, the Tukdrub Sangwa Gyachen, and in the course of this, he had his own Vajrakilaya revelation, the Pudri Rekpung”. The name ‘Namchak Putri’ is derived from the Vajrakilaya revelations of Rigdzin Düddul Dorje, who is included in the Dudjom Incarnation Line. Dudjom Rinpoche did a Vajrakilaya Namchak Pudri Gutor practice every year in Kongpo, Tibet, at his center Lama Ling.. Lama Tharchin Rinpoche wrote “I remember Dudjom Rinpoche doing a Namchak Pudri Vajrakilaya Gutor every year since I was with him from the age of eight. After escaping from Tibet, we continued to do this practice at Dudjom Rinpoche’s center Duddul Raptenling in Orissa, India”. Before his passing, Lama Tharchin Rinpoche was able to oversee an English translation of most of the Namchak Pudri practice texts, and was able to lead a Namchak Pudri Gutor practice in his center in the USA. ↑ Khye'u-chung Lotsawa Translation and Text Production Team, 2009, founded by Lopön Ogyan Tanzin Rinpoche. ↑ Dudjom Rinpoche’s Collected Works, Volume Tha: p.80. ↑ The Tukdrub Sangwa Gyachen is included in Volume Ca of the Collected Works of Dudjom Lingpa. ↑ According to Khye'u-chung Lotsawa Translation and Text Production Team, 2009, founded by Lopön Ogyan Tanzin Rinpoche. ↑ According to a Namchak Pudri Gutor presentation text written by Lama Tharchin Rinpoche. This page was last edited on 30 June 2017, at 23:51.